13-Apr-15Created by Mr. Lafferty Maths Department Solving Sim. 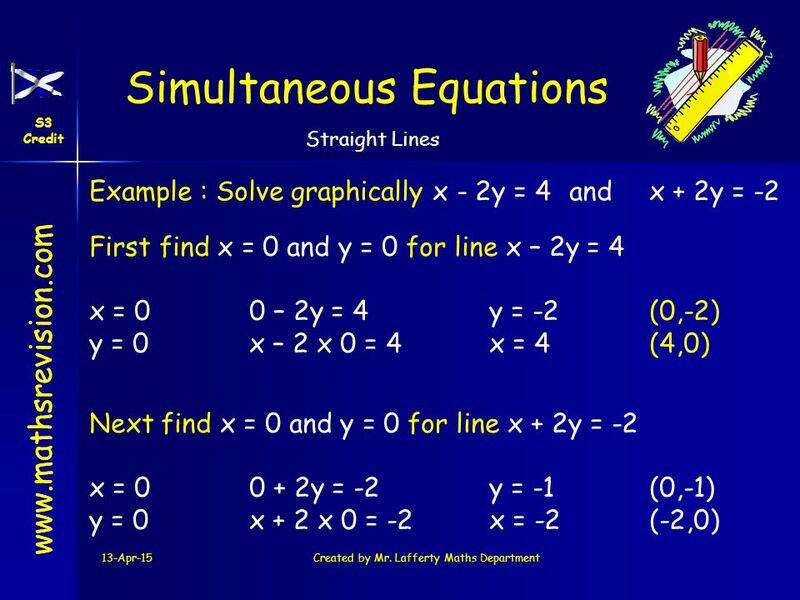 Equations Graphically Solving Simple Sim. 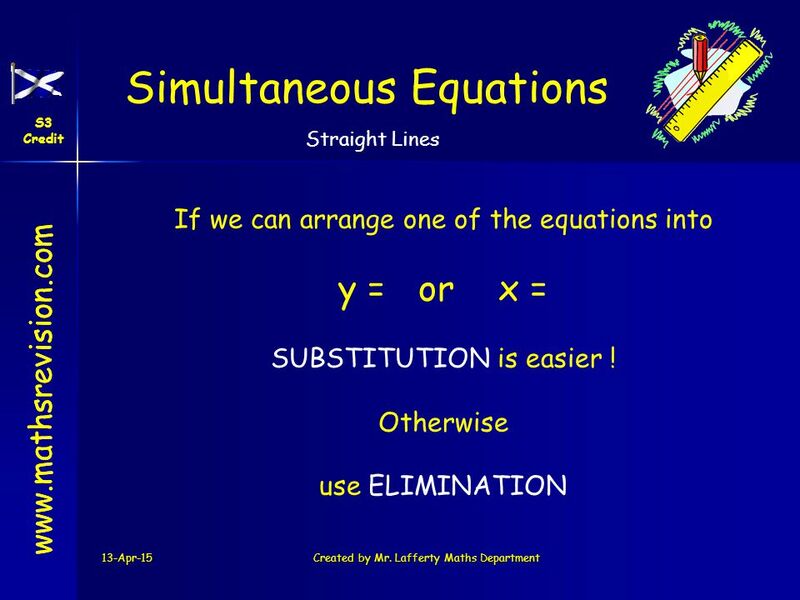 Equations by Substitution Simultaneous Equations. 4 www.mathsrevision.com Simultaneous Equations S3 Credit Straight Lines 13-Apr-15Created by Mr. Lafferty Maths Department (1,3) Q. 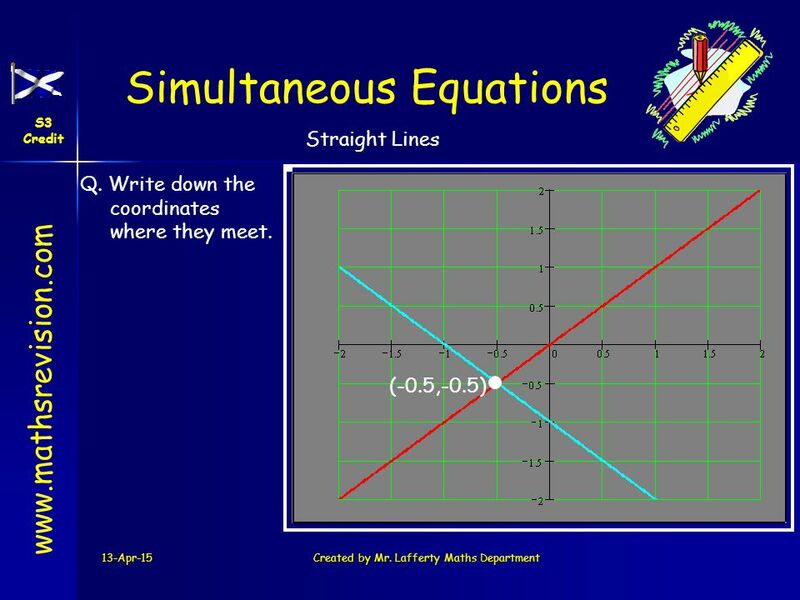 Write down the coordinates where they meet. 5 www.mathsrevision.com Simultaneous Equations S3 Credit Straight Lines 13-Apr-15Created by Mr. Lafferty Maths Department (-0.5,-0.5) Q. 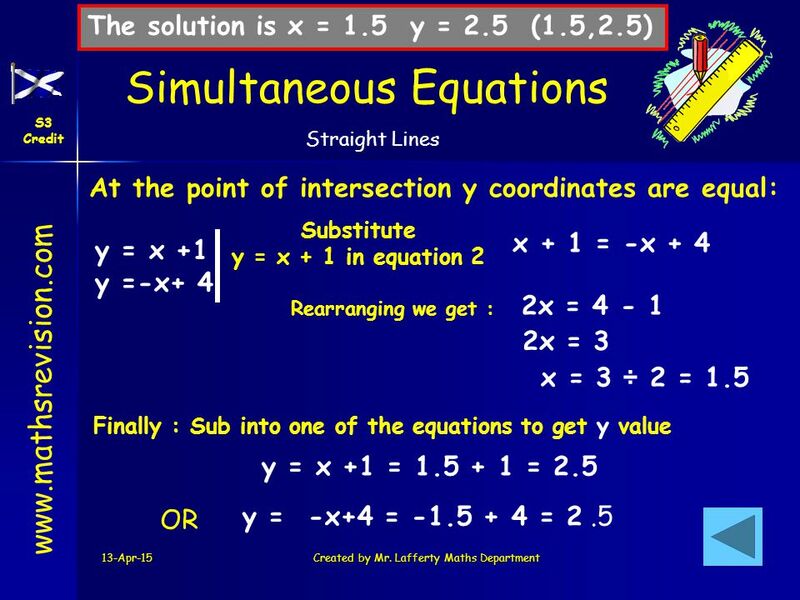 Write down the coordinates where they meet. 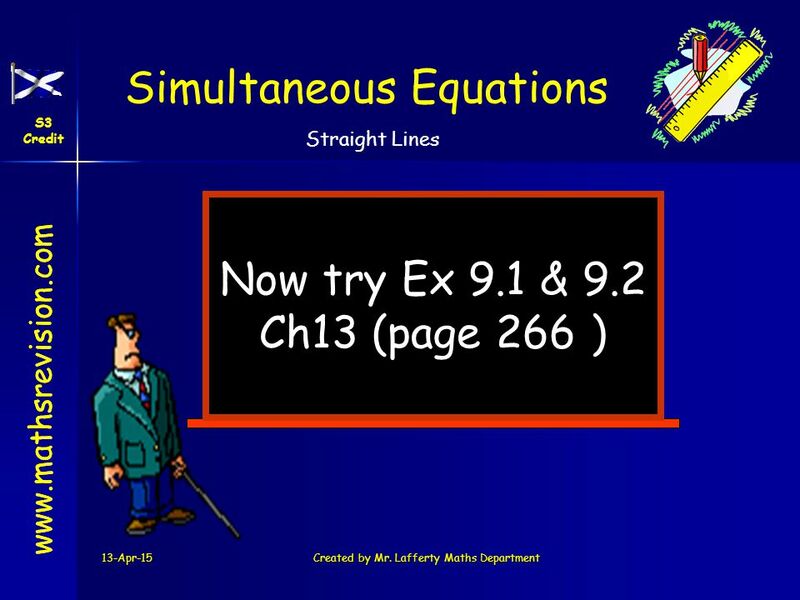 6 www.mathsrevision.com Simultaneous Equations S3 Credit Straight Lines 13-Apr-15Created by Mr. Lafferty Maths Department Q. 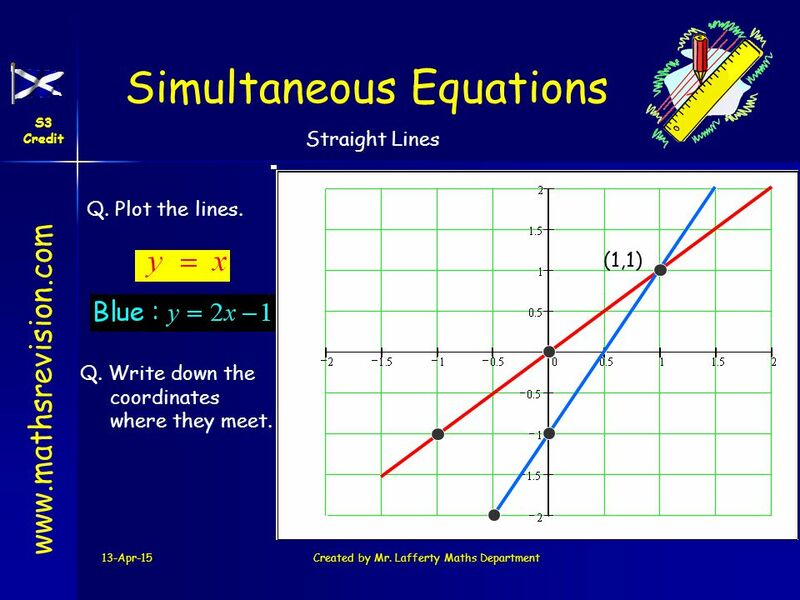 Plot the lines. 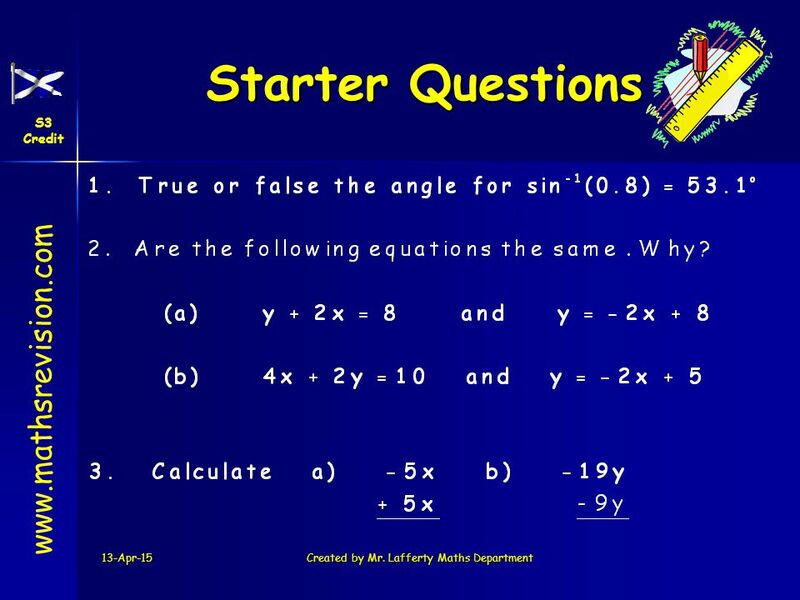 (1,1) Q. 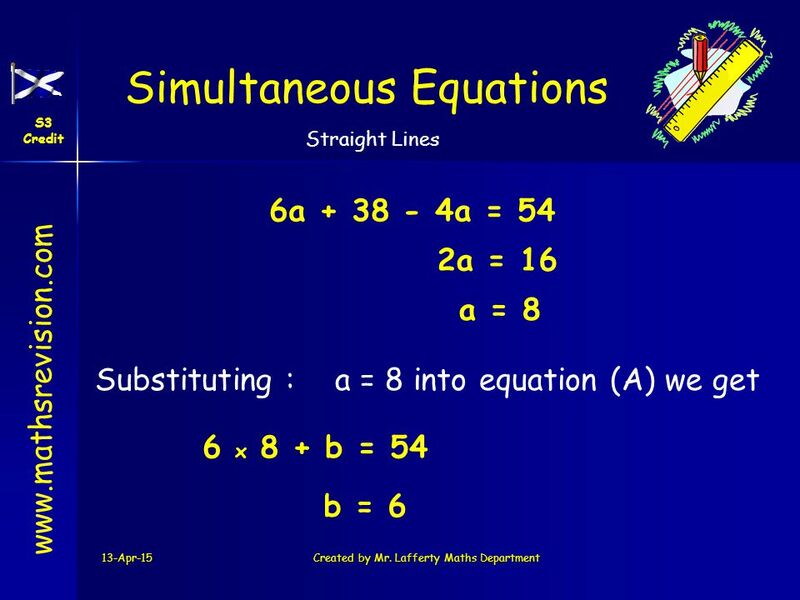 Write down the coordinates where they meet. 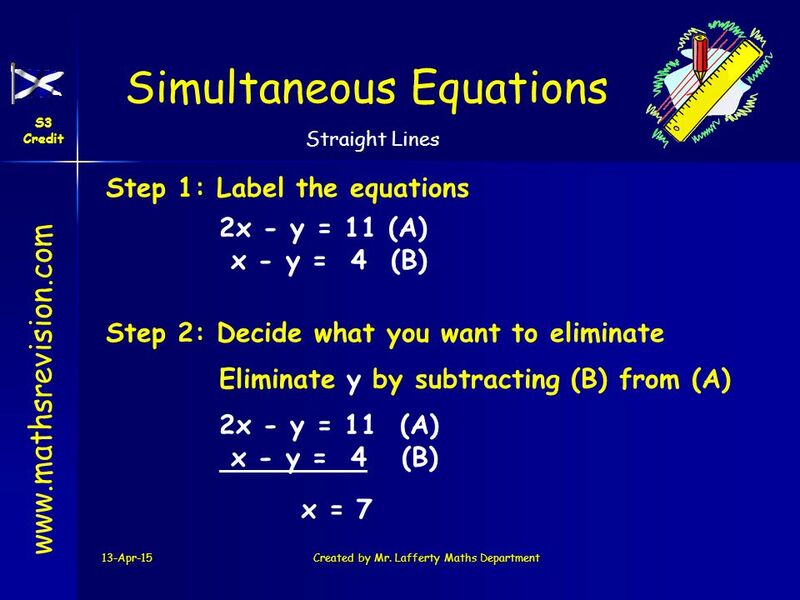 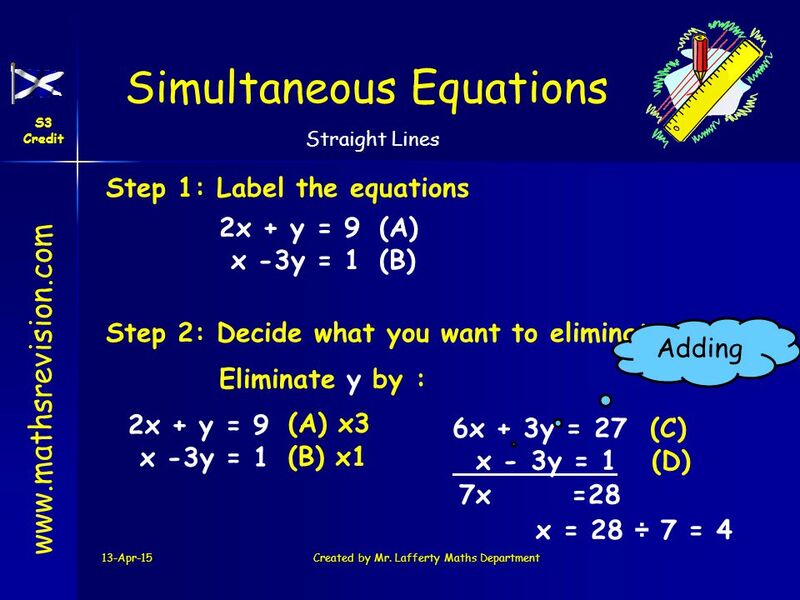 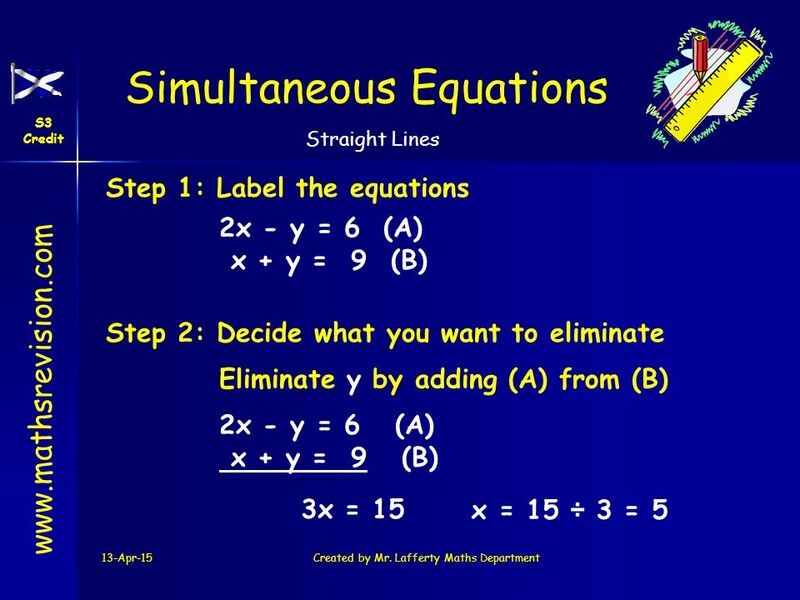 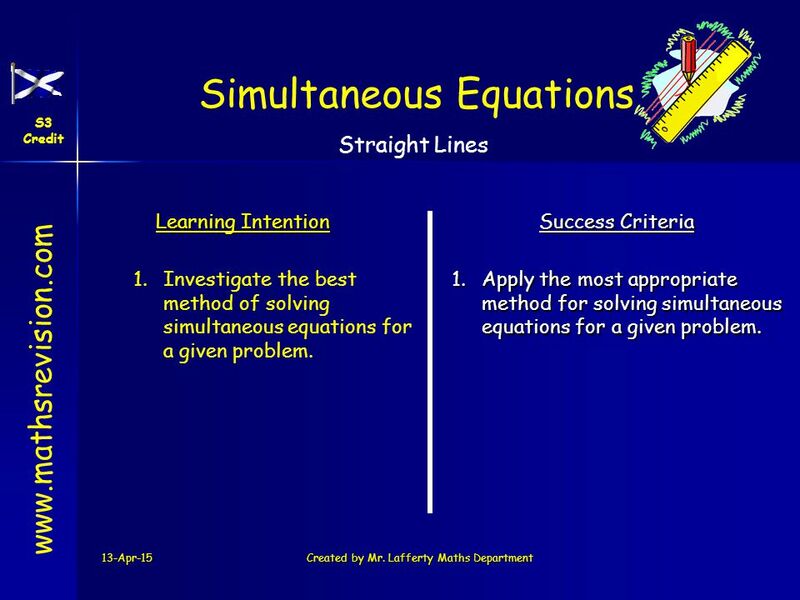 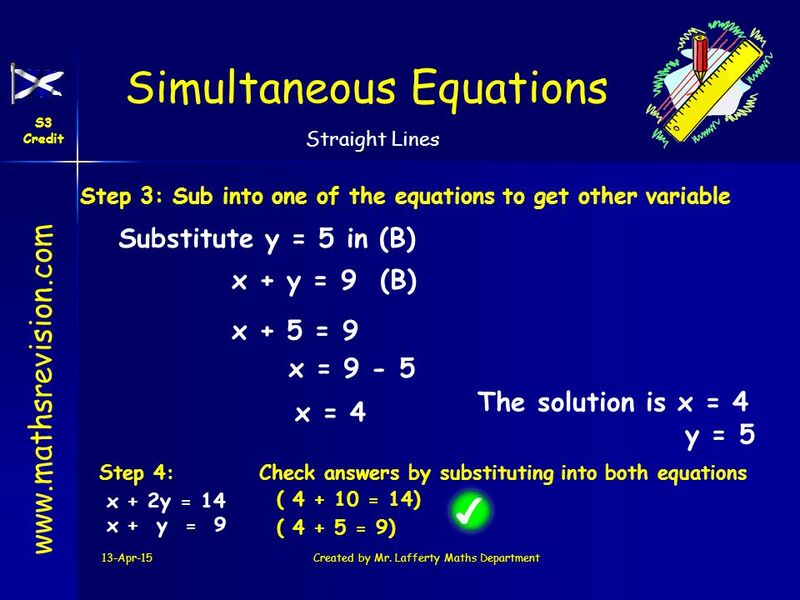 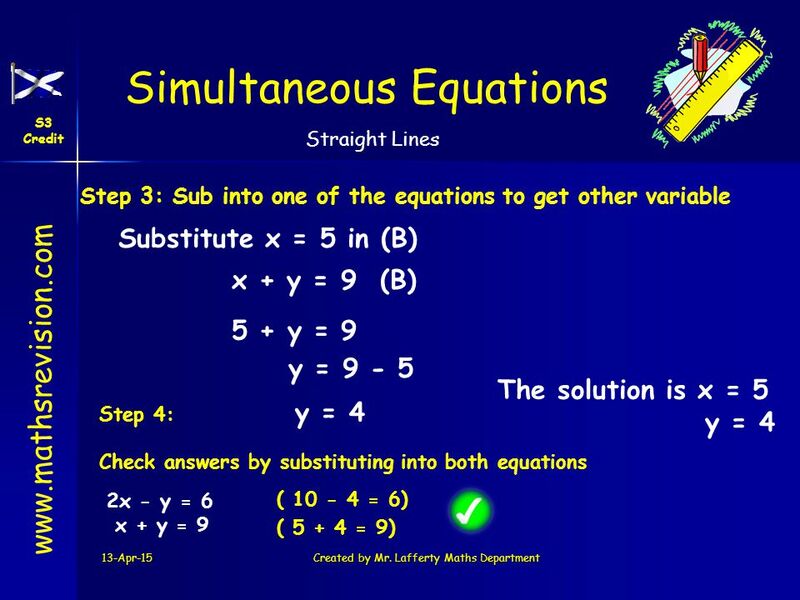 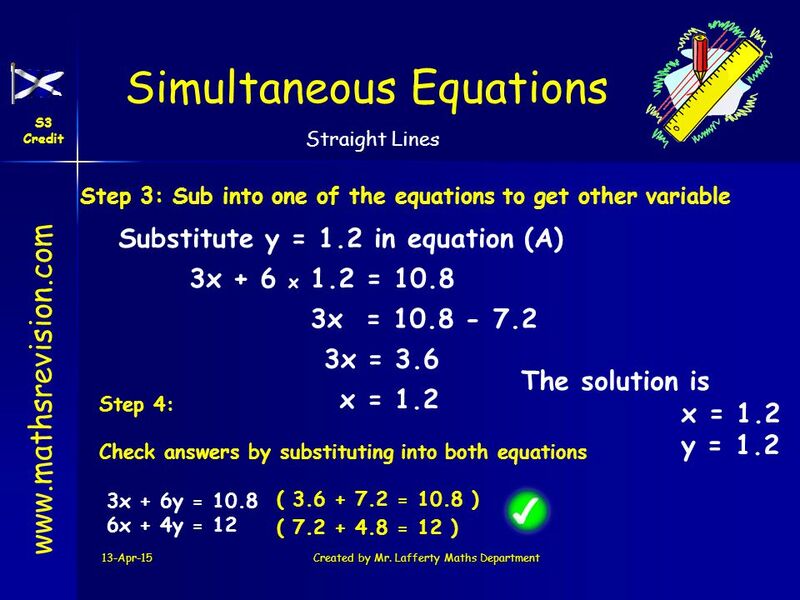 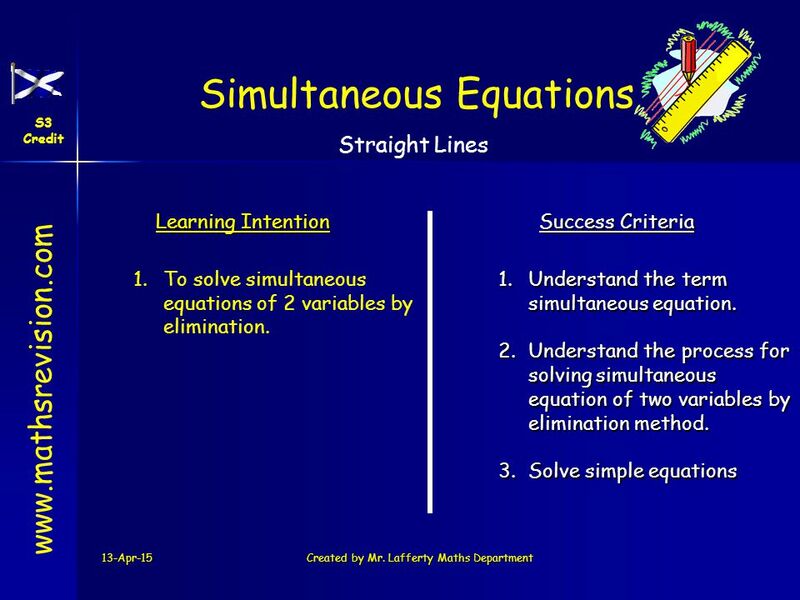 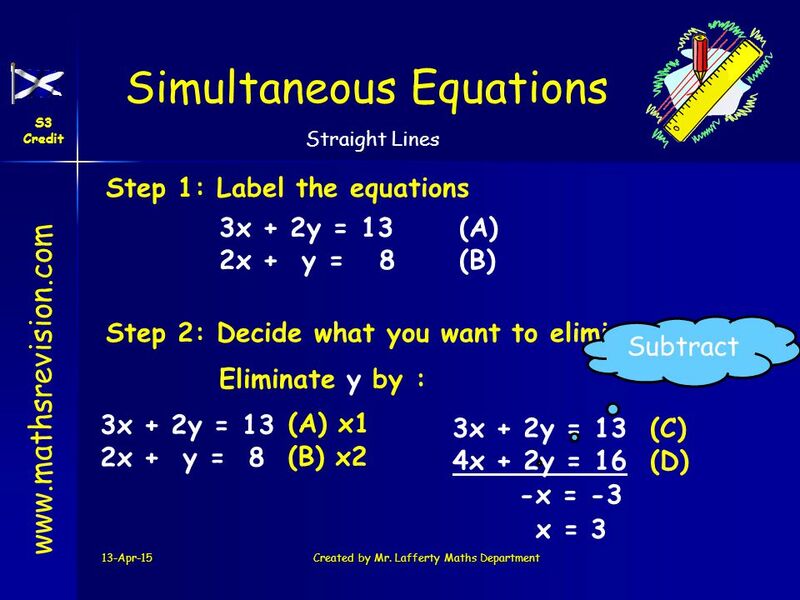 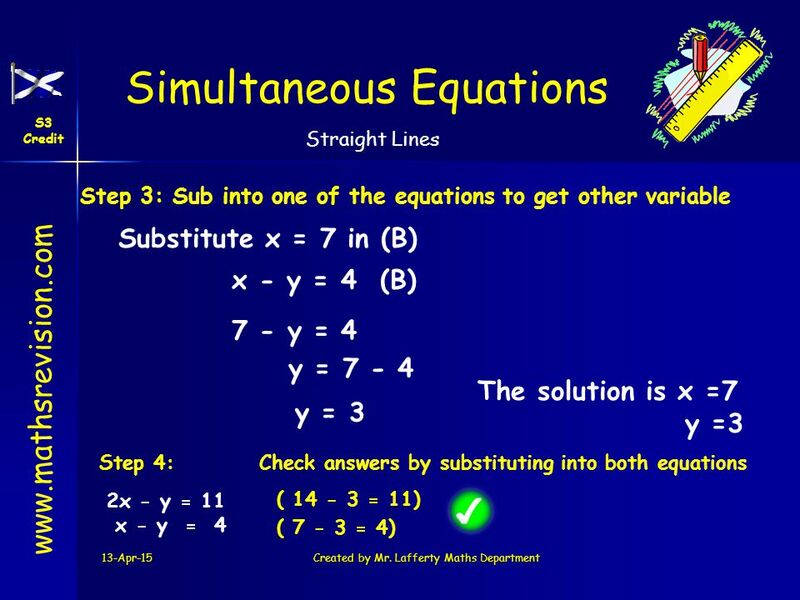 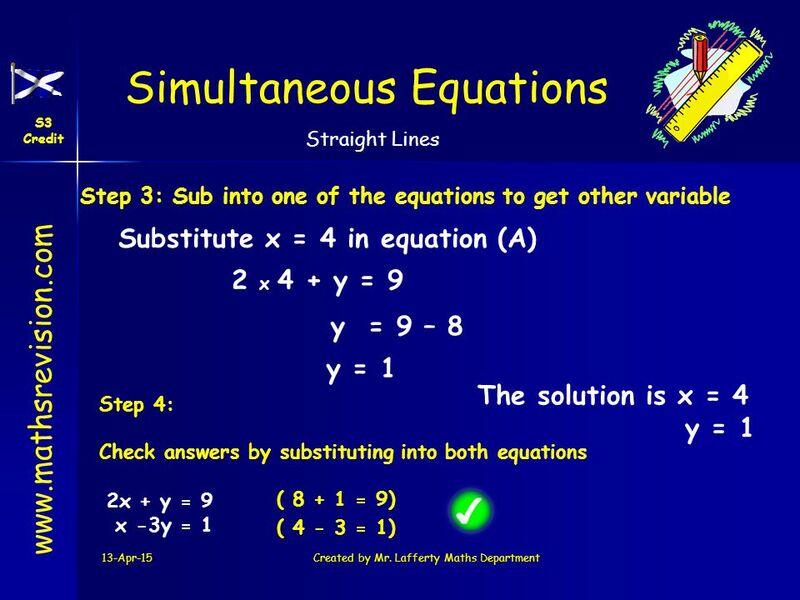 9 www.mathsrevision.com Simultaneous Equations S3 Credit Straight Lines 13-Apr-15Created by Mr. Lafferty Maths Department Key steps 1. 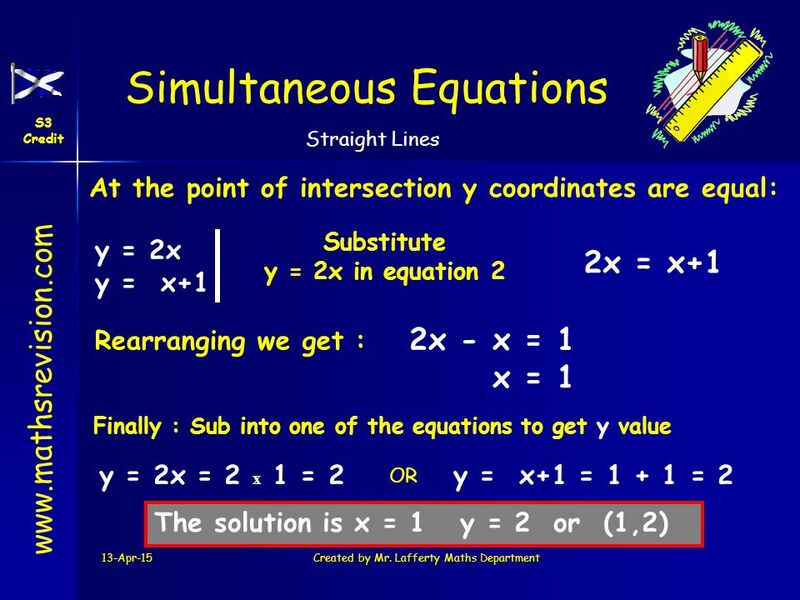 Make or Fill in x – y table 2. 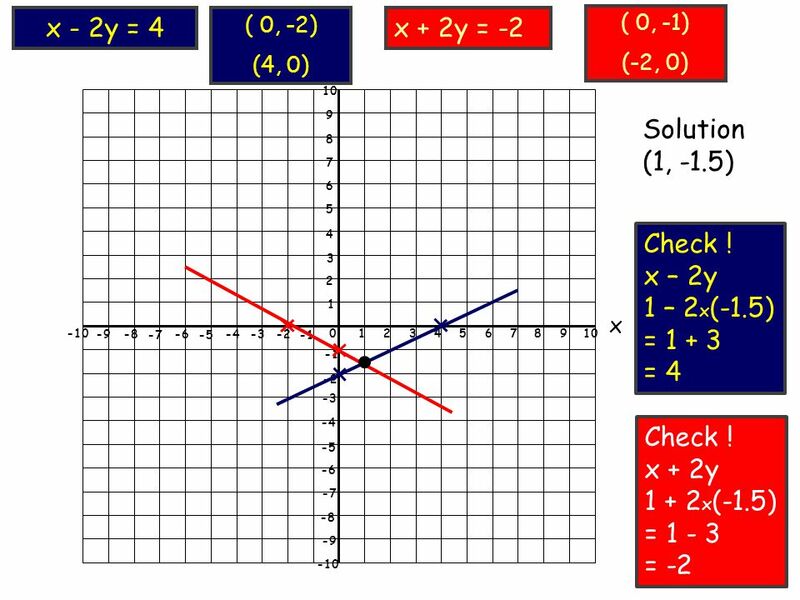 Plot points on the same graph ( pick scale carefully) 3. 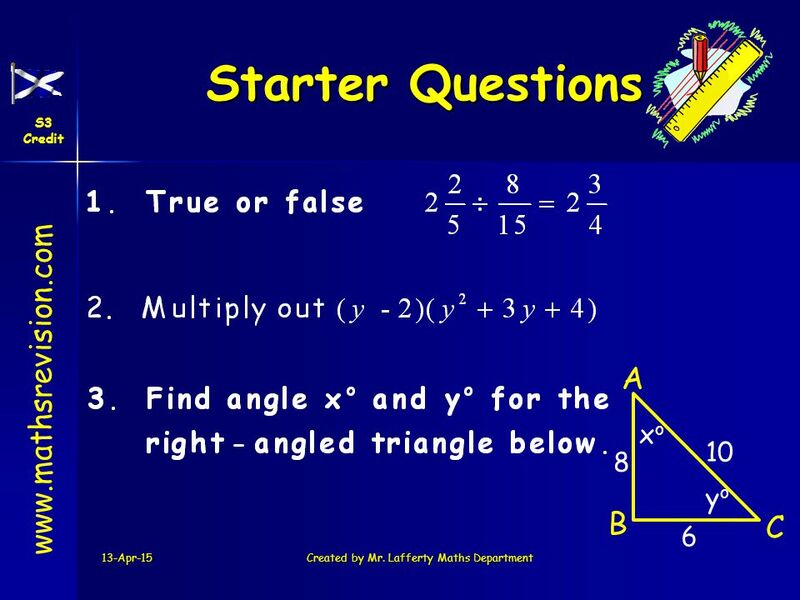 Identify intersection point ( where 2 lines meet) 4. Interpret graph information. 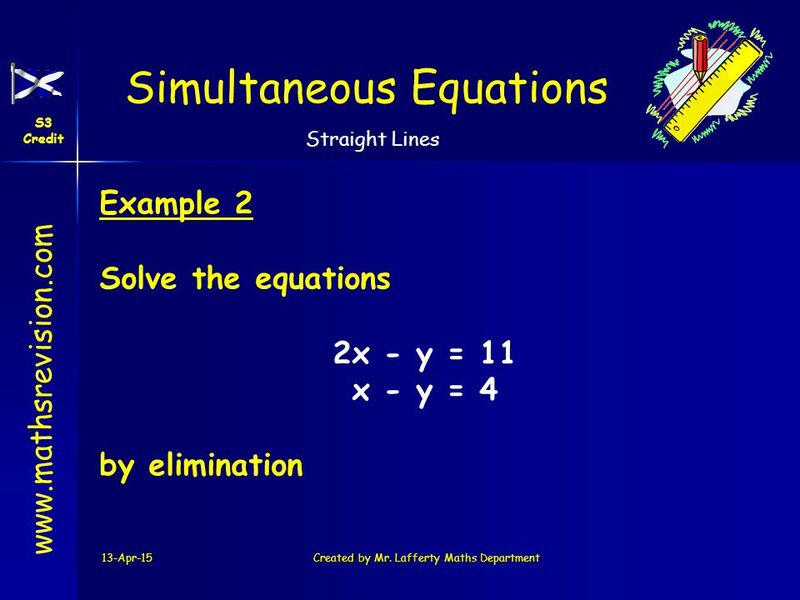 16 www.mathsrevision.com Simultaneous Equations S3 Credit Straight Lines 13-Apr-15Created by Mr. Lafferty Maths Department www.mathsrevision.com Key points for quick method for graphical solution 1.Find two points that lie on each of the two lines. 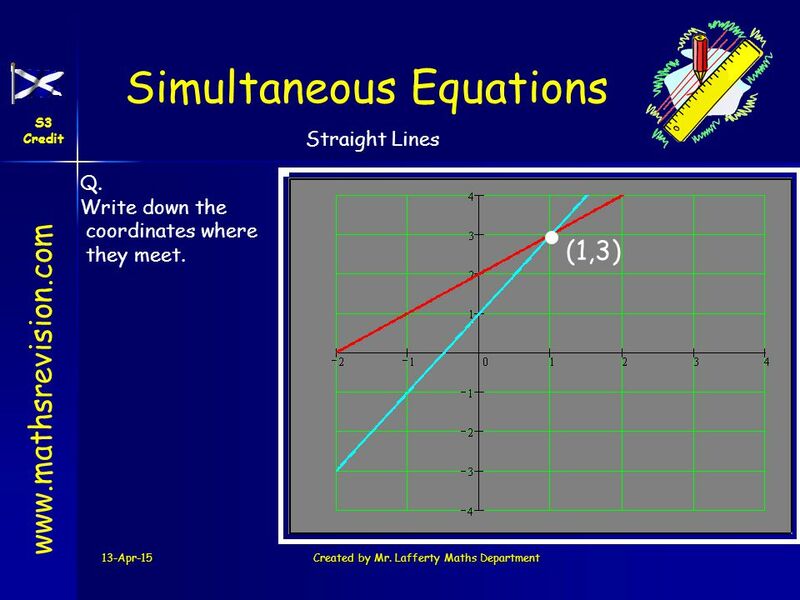 Normally easy to find x = 0 and y =0 coordinates for both lines 2.Plot the two coordinates for each line and join them up. 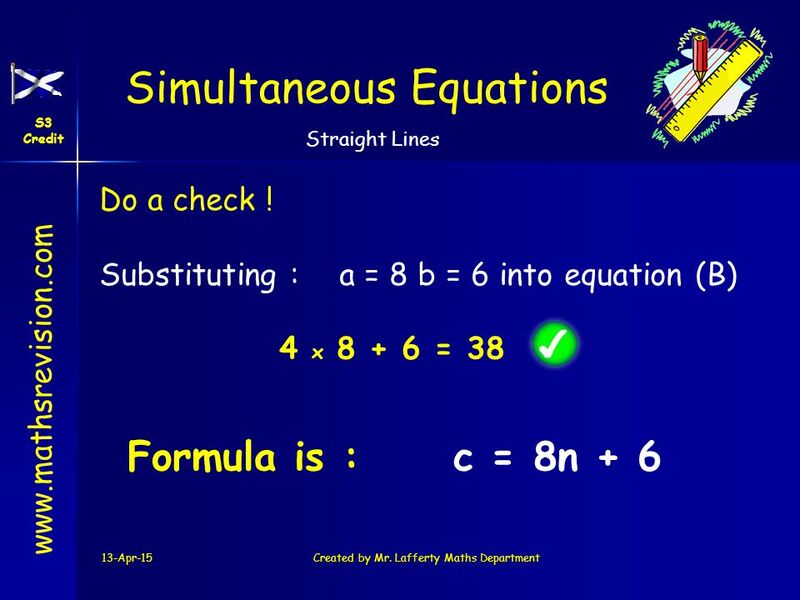 Extend each line if necessary so they cross over. 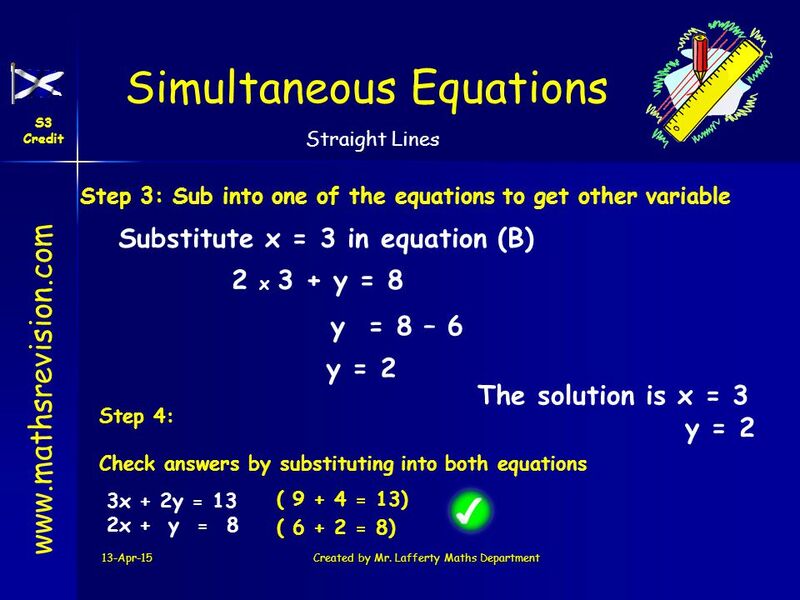 3.Read off solution where lines meet and check that it satisfies both equations. 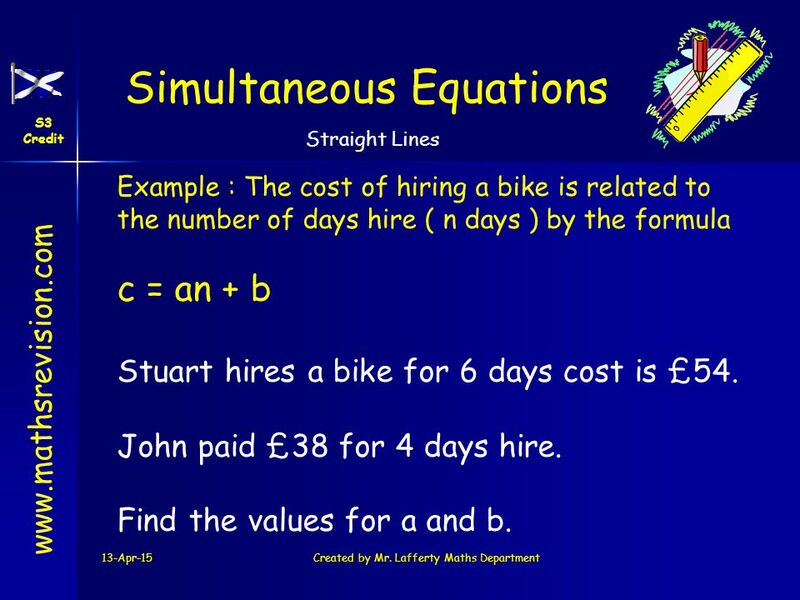 55 www.mathsrevision.com Simultaneous Equations S3 Credit Straight Lines 13-Apr-15Created by Mr. Lafferty Maths Department Example : The cost of hiring a bike is related to the number of days hire ( n days ) by the formula c = an + b Stuart hires a bike for 6 days cost is £54. 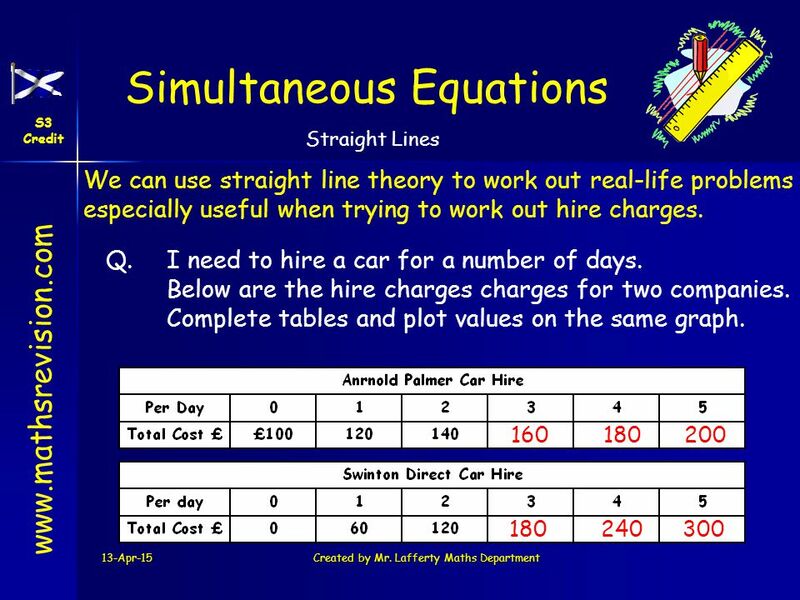 John paid £38 for 4 days hire. 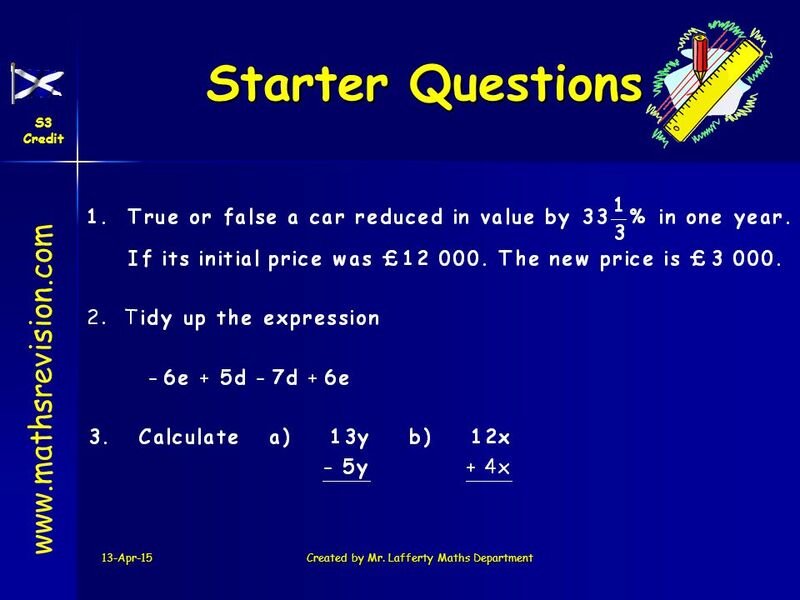 Find the values for a and b. 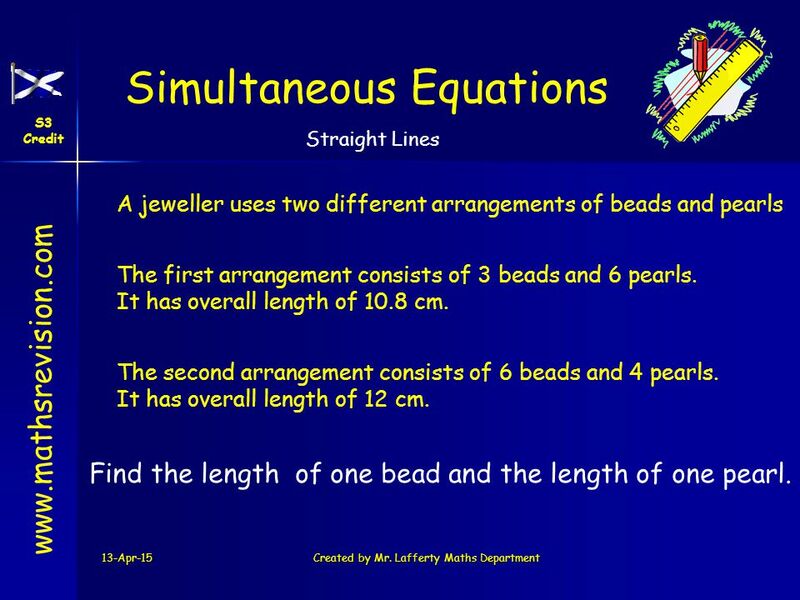 62 www.mathsrevision.com Simultaneous Equations S3 Credit Straight Lines 13-Apr-15Created by Mr. Lafferty Maths Department A jeweller uses two different arrangements of beads and pearls The first arrangement consists of 3 beads and 6 pearls. It has overall length of 10.8 cm. The second arrangement consists of 6 beads and 4 pearls. 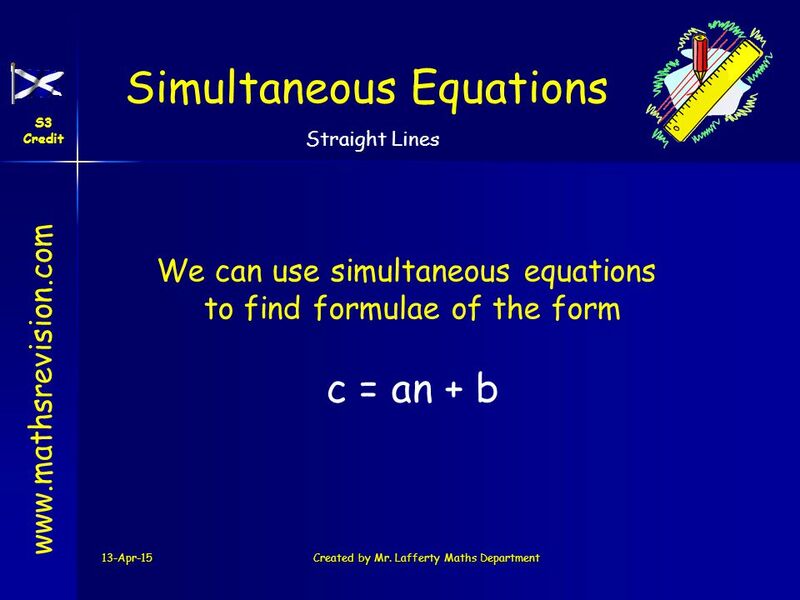 It has overall length of 12 cm. Find the length of one bead and the length of one pearl. 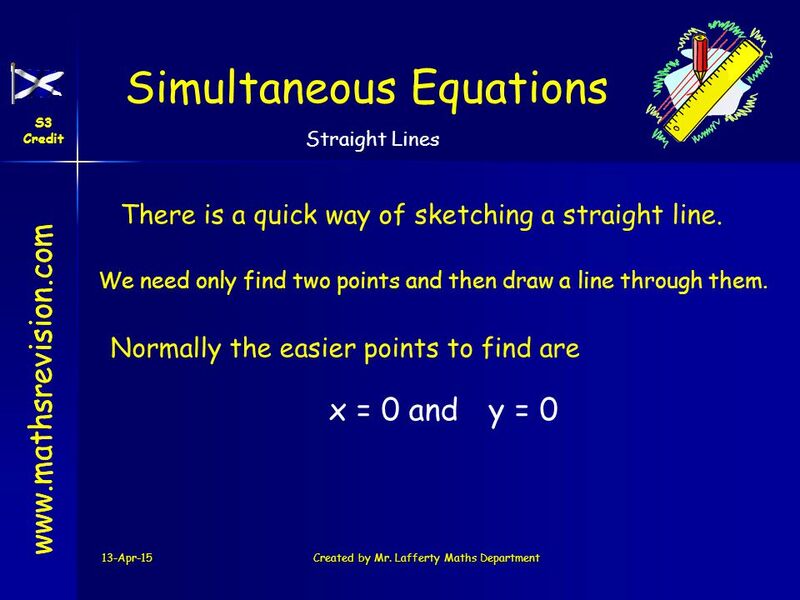 66 www.mathsrevision.com Simultaneous Equations S3 Credit Straight Lines 13-Apr-15Created by Mr. Lafferty Maths Department One evening 4 adults and 6 children visited the sports centre. 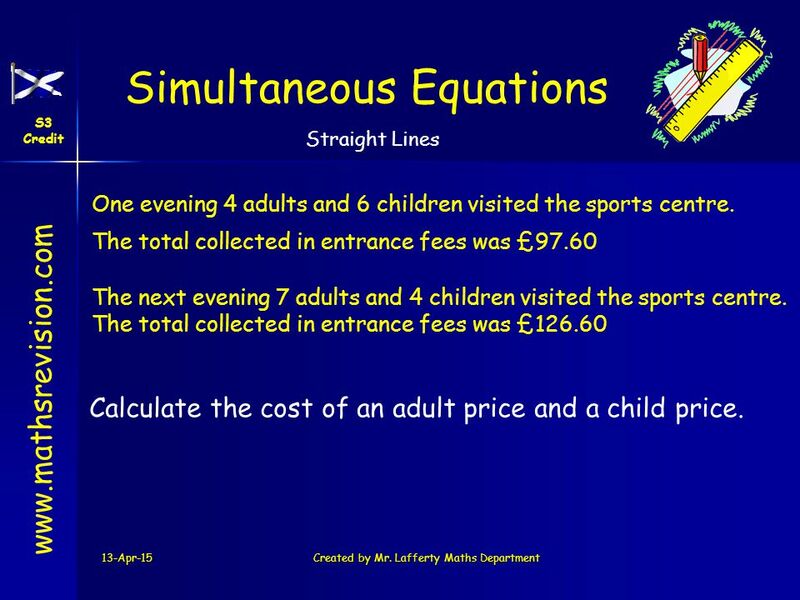 The total collected in entrance fees was £97.60 The next evening 7 adults and 4 children visited the sports centre. 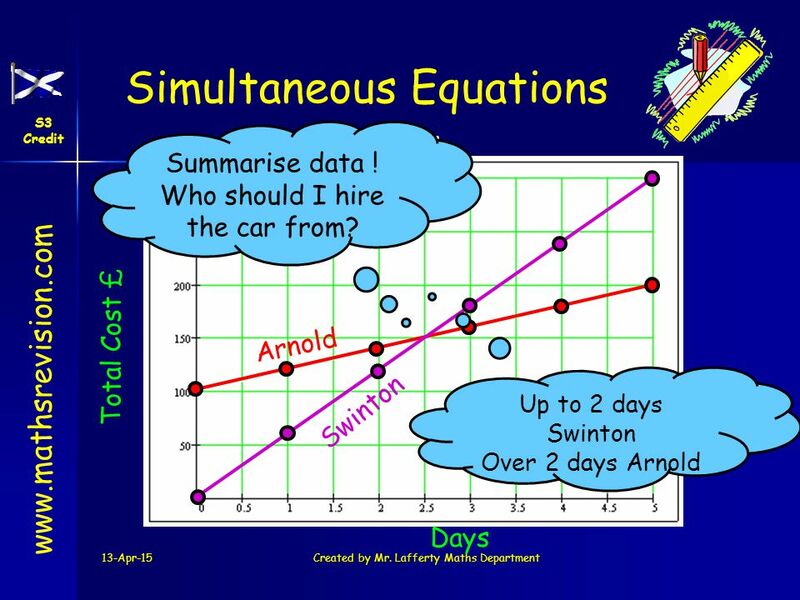 The total collected in entrance fees was £126.60 Calculate the cost of an adult price and a child price. 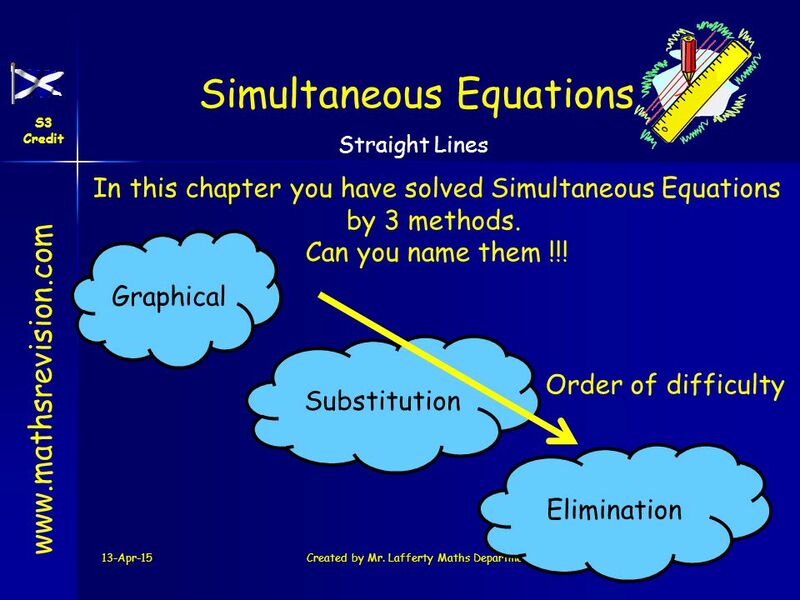 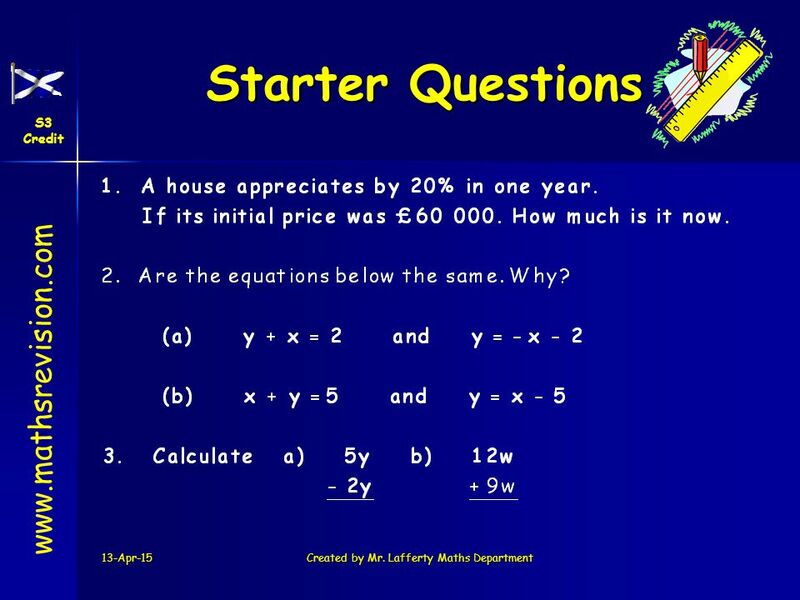 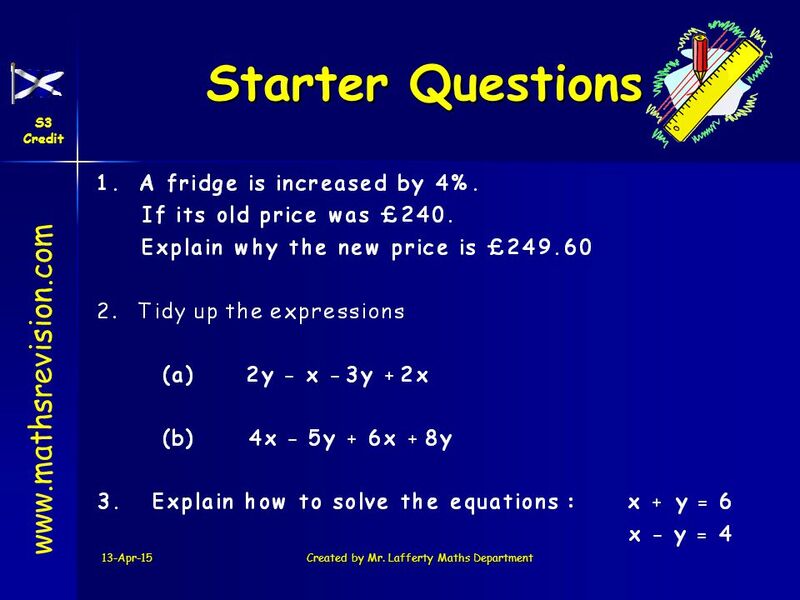 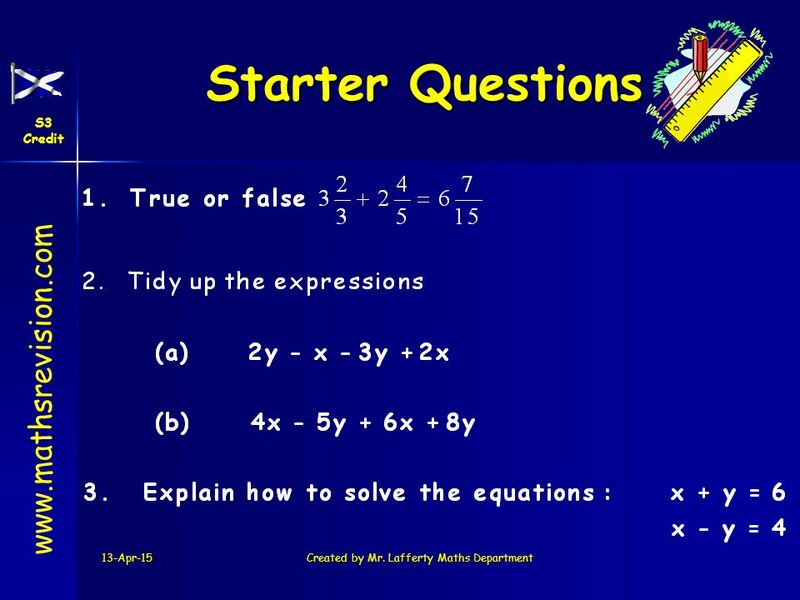 Download ppt "13-Apr-15Created by Mr. Lafferty Maths Department Solving Sim. 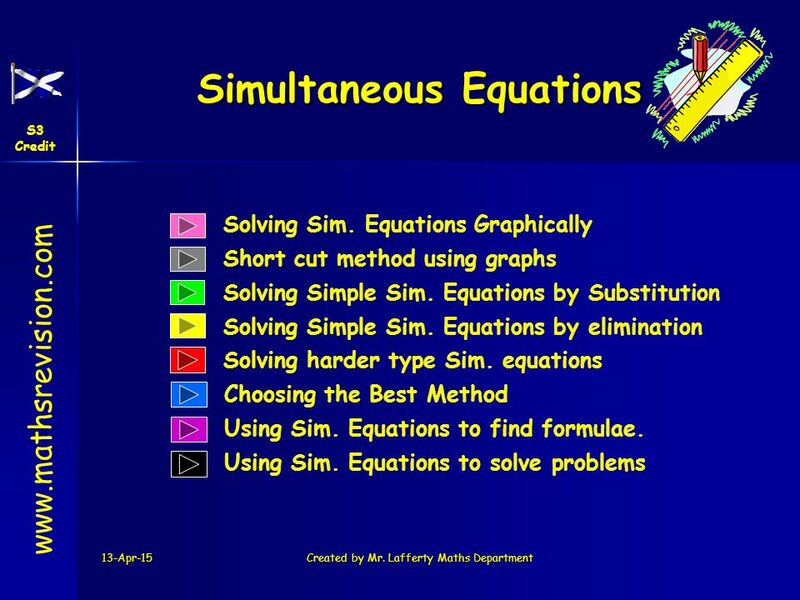 Equations Graphically Solving Simple Sim. 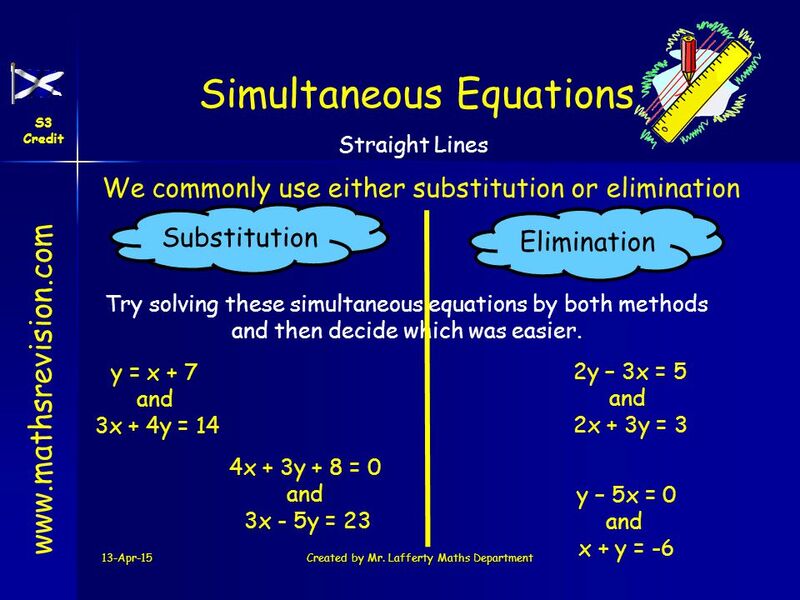 Equations by Substitution Simultaneous Equations." Created by Mr. Lafferty Finding roots graphically Finding roots by factorising Finding roots using formula Solving Quadratic Int. 15-Apr-15Created by Mr. Lafferty1 Statistics Mode, Mean, Median and Range Semi-Interquartile Range ( SIQR ) Nat 5 Quartiles Boxplots. 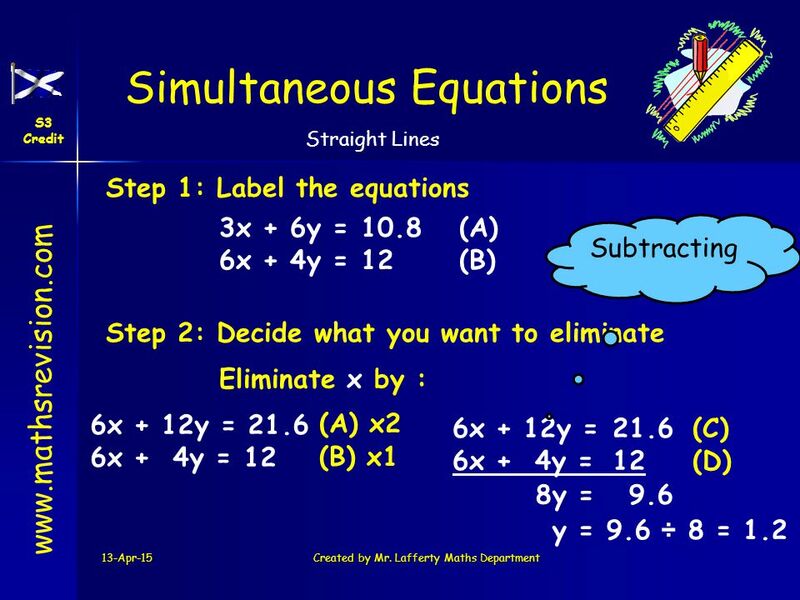 Noor Language Schools Prep(3) Algebra Unit(1) Equations. 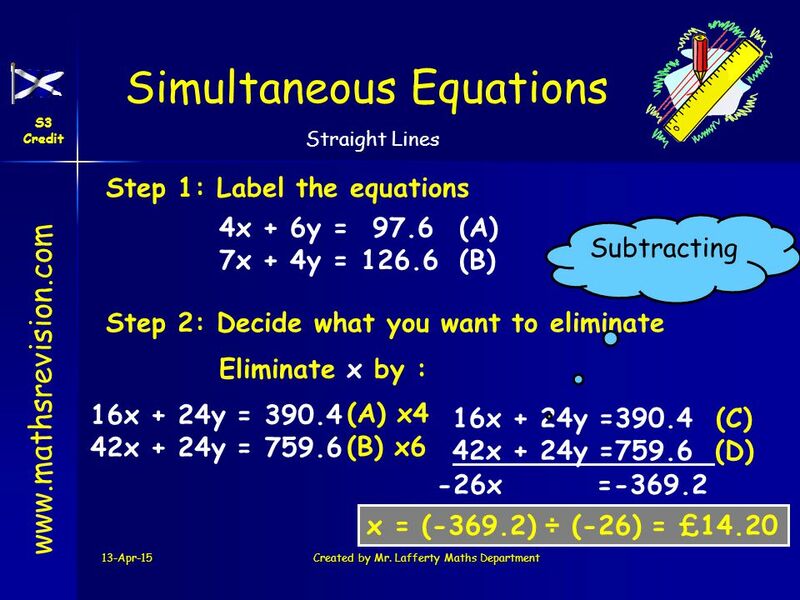 17-Apr-15Created by Mr. Lafferty Maths Dept Ordering integers Integers Add / Sub Mathematically Letters and Numbers Multiplying Integers. 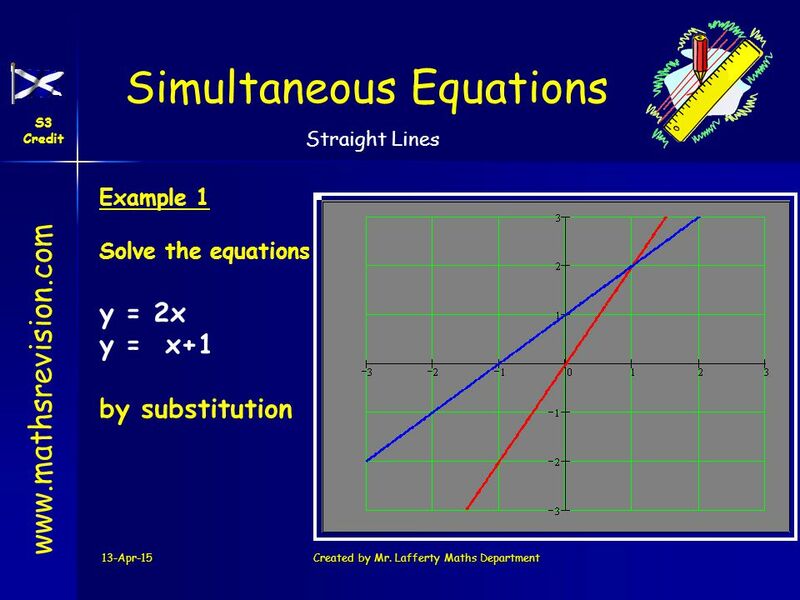 Level 4 Mathematical Similarity Calculating Scale Factor Similar Triangles Parallel Line Triangles Scale Factor in 2D (Area) Scale. 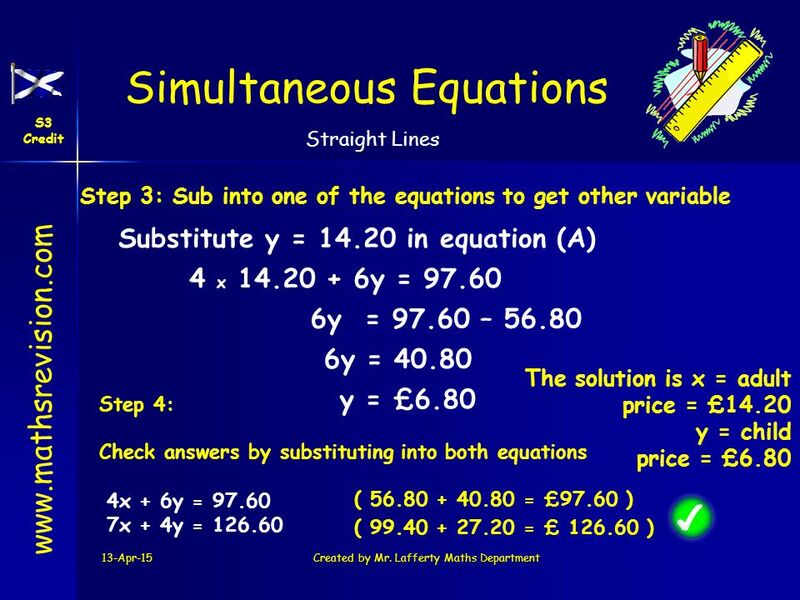 Nat 5 Quadratic Functions Solving quadratic equations graphically Recap of Quadratic Functions / Graphs Factorising Methods for Trinomials. 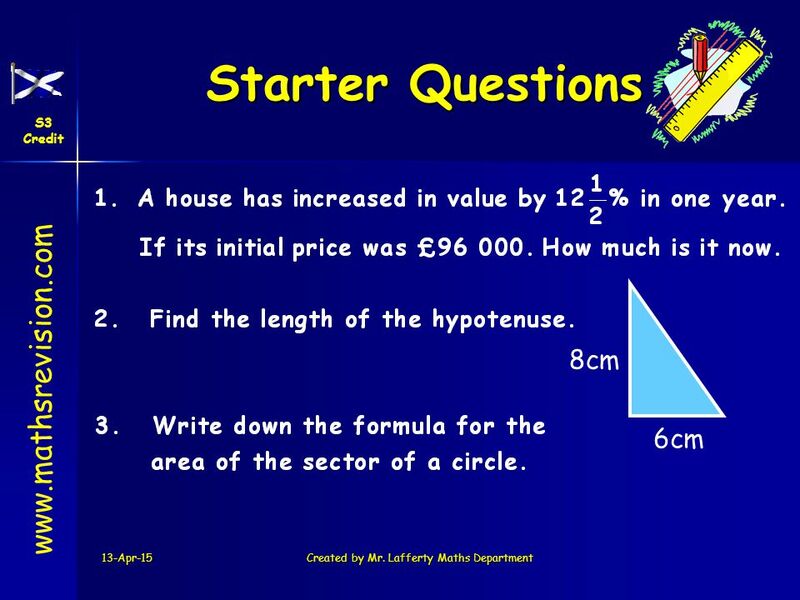 S5 Int 1 Area of a rectangle Area of composite shapes Area of a right-angled triangle Simple Areas Area of a circle. 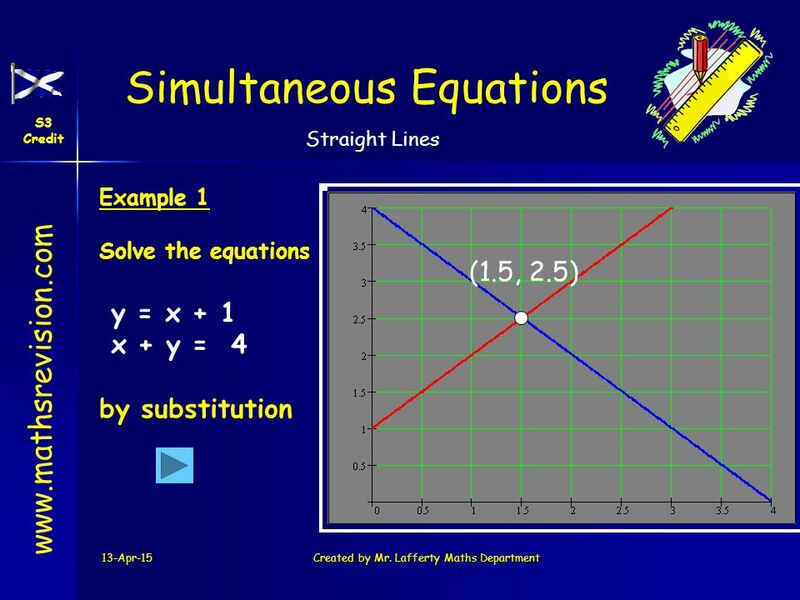 Drawing Straight line graphs The gradient from Coordinates General Equation y = mx + c S4 Credit Equation from 2 Points Best – fitting. 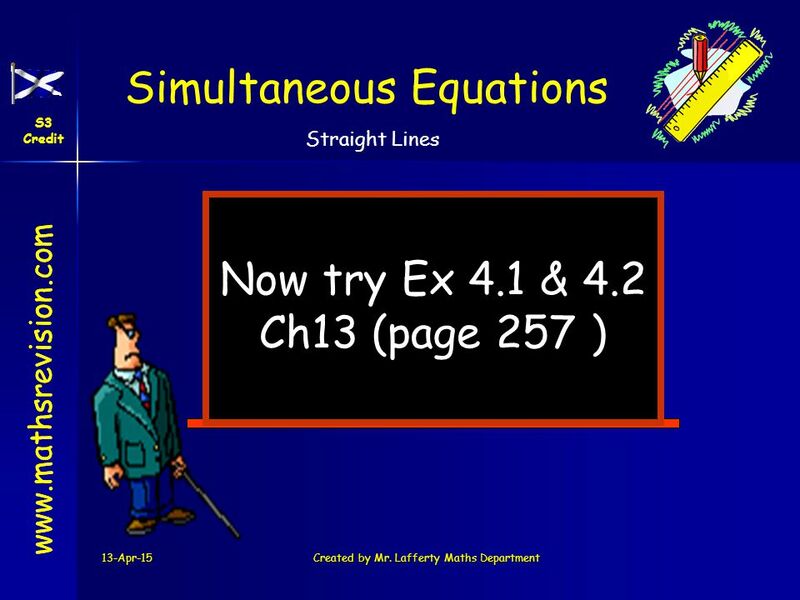 Systems of Equations Section 4.1 MATH Mr. Keltner. 18-May-15Created by Mr. Lafferty Maths Dept. 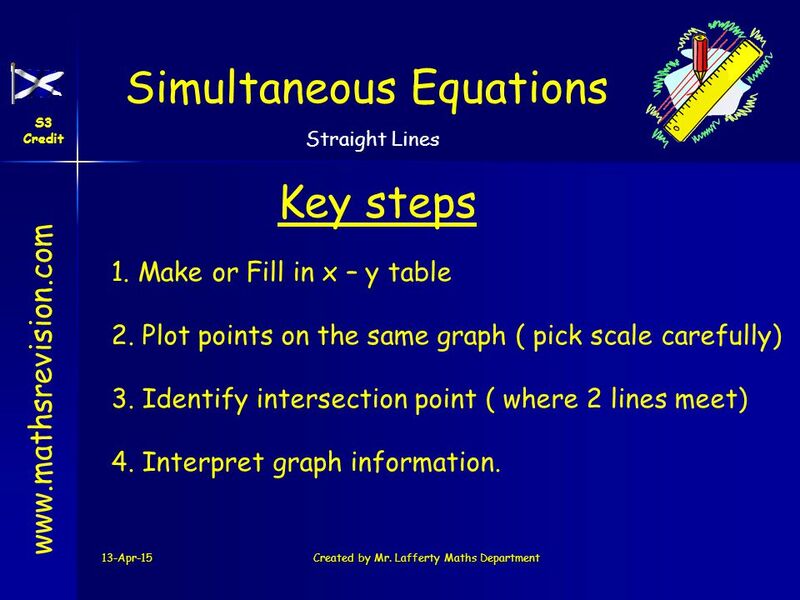 Coordinates Plotting Coordinates Coordinates Different Grids Proper Names Extending. 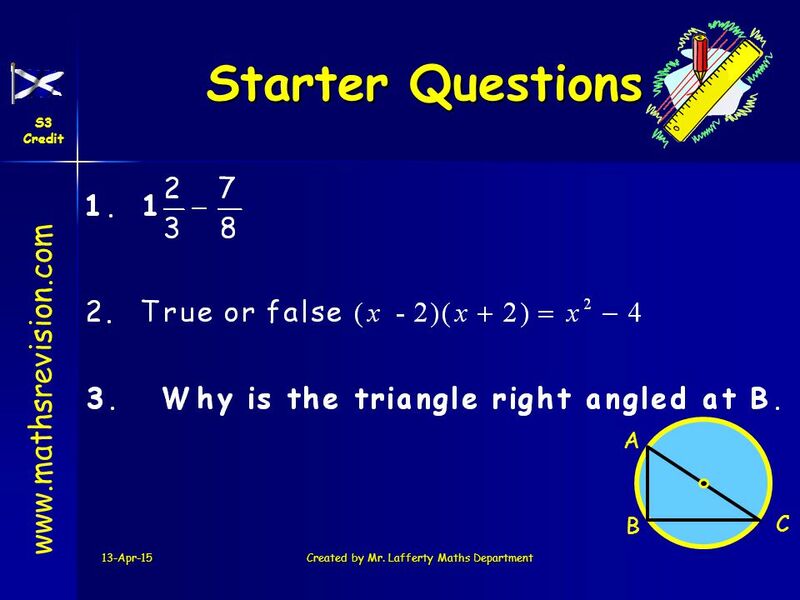 S5 Int 1 Area of a rectangle Area of composite shapes Area of a right-angled triangle www.mathsrevision.com Simple Areas Area of a circle.